Are you a fan of slushy drinks like I am. 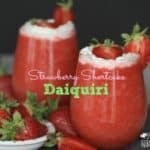 This Strawberry Shortcake Daiquiri is the perfect summer cool down drink! To make strawberry simple syrup, combine 1 cup of sugar, 1 cup of water and 1/2 cup of sliced strawberries. Bring to a boil. Cook until sugar dissolves and cool. In a blender, add ice, 1/2 cup simple syrup, whipped cream vodka, coconut rum, almond milk and 2 cups of strawberries. Turn blender on and process until daiquiri is thick and ice is dissolved. Serve with whipped cream and a strawberry garnish.